As I predicted, re-establishing the weak yen/weak dollar/strong euro status quo will swiftly lead to a collapse of the European economy for this is a near-perfect repeat of the strong yen/weak dollar/no euro economy of the early 1990's. Japan's yen became very strong, the Japanese flew all over the earth, buying things, investing and vacationing like mad. Then suddenly, it all collapsed and as the American economy got stronger, Japan went into a real depression. Now it is in a fake one but the signs are all pointing to Europe going into a real depression soon. The chief executive of one of Germany's largest state-backed banks warned that foreigners were increasingly loath to extend credit to financial institutions in Europe's largest economy, which could spark a crisis. "We sense reluctance on the part of foreign partners to extend credit to German banks," WestLB CEO Alexander Stuhlmann told journalists on the sidelines of a bank event, according to wire service reports. "If we have a banking crisis in Germany with other countries cutting us off, then other banks will also face difficulties." His comments come days after a German lender, SachsenLB, said it required a credit line of 17.3 billion euros ($23.2 billion) because of the investments it had made in securities affected by the U.S. subprime mortgage crisis. IKB Deutsche Industriebank (DE:806330: news, chart, profile) required a similar bailout. I was very bemused when Europe did nearly all the heavy lifting when the US triggered a global banking meltdown. I wondered, why on earth was Europe doing this suicidal act? A lifetime of pulling when others get lazy and become a dead weight, I thought, 'Oh no, the Europeans have been conned into doing all the work of keeping the currency markets going.' And so it is: they have been fooled by the bidding up of the euro by the other industrial powers into thinking they could exist mainly as the nexus of all banking and so the strong euro ravaging their ability to export manufactured goods wouldn't matter. This notion is dismissed by the Goddess of History, a woman addicted to repeating herself over and over again. The value of understanding history is the ability to see into the future because of her rather tedious tendency to do the same thing over and over again. Actually, humans seem to be set in certain ways which makes the work of a prophetess easy, I must say. For a long time, I have marveled as Europe allowed both the US and Japan play an increasingly dangerous currency devaluation game. Using the euro as their fulcrum, they have see-sawed each other with increasing fury. The Chinese have long sat on the Japan side of this teeter-totter and so the US has been totally unable to weaken the dollar with both Japan and China hoarding dollars in the world's #1 and #2 FOREX reserves. With world currency markets involved in the financial equivelent of WWI trench warfare with the troops gunning each other down, fighting over mere inches of territory, Europe seemed to be in this endless summer of happiness as they found inflation defeated as everything foreign including oil, got cheaper and cheaper as the euro shot up in value vis a vis the dollar, yen and yuan. For example, the yuan has risen against the dollar but thanks to the US/Japan trench warfare, the yuan has dropped in value against the euro so Europe is enjoying a tsunami of Chinese goods pouring in, it is now at a level where it rivals the flood of Chinese goods to the US! Of course, there is also a flood of Japanese and American goods and Europe is now rapidly becoming what the US has been for a long time: the ultimate destination of all excess trade. The last thing Europe needs right now is a strong currency! For the dangers of this position are increasingly obvious: manufacturing in Europe will collapse! And this will trigger a depression since that would be the only way to set the trade deficit to rights again. Japan stumbled upon the key to circumventing the logic of the fiat currency regime set in place by Bretton Woods II back in the early 1970's. If a central bank has the political power to accumulate infinite FOREX reserves, they can take over the relative value of a currency and manipulate the value of the currency of a trading partner for their own benefit! The Chinese noticed this rather quickly since Japan launched this aggressive campaign to control the value of the dollar and now has done the same and as of this year, all major trading partners outside of Europe and the US are doing this! Investor confidence in Germany, Europe's largest economy, fell more than economists forecast to an eight-month low in August as equity markets tumbled. The ZEW Center for European Economic Research in Mannheim today said its index of investor and analyst expectations dropped to minus 6.9 from 10.4 in July. That's the lowest since December. Economists expected a decline to minus 1.5, according to the median of 36 forecasts in a Bloomberg News survey. Europe's banks were very stupid. They bought up a lot of US debts hoping to use the higher interest rates from them to make themselves richer because they terribly misunderstand what is going on (HAHAHA). Heck, do they read my news? No? Of course not! So instead of increasing their FOREX reserves like mad, they did the exact opposite! To the point of even selling off their GOLD reserves! Switzerland, of all places, even fatally declared that gold had no intrinsic interest as a currency weight and so they were selling it off! 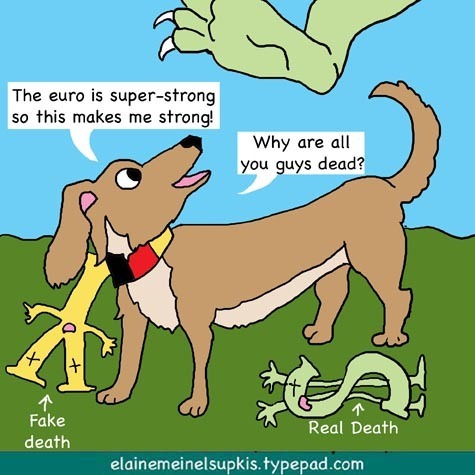 Spain had to sell its gold reserves and so we see the last of the Spanish imperial gold vanish as all of Europe decided the euro would indeed, be the world's fiat currency, look at how strong it is! All they have to do is set interest rates and voila! It would respond! Landesbank Sachsen Girozentrale, the German state-owned bank getting emergency funding, has about 3 billion euros ($4 billion) in investments linked to U.S. subprime mortgages, according to a person with knowledge of the matter. The bank's Ormond Quay finance unit holds the securities among its AAA rated asset-backed bonds, according to the person, who declined to be identified because the holding has not been made public. Ormond Quay invests in securities backed by residential mortgages, commercial property and credit cards. The Leipzig-based lender is the second German bank after IKB Deutsche Industriebank AG to get funding after a credit crunch prevented finance units from selling commercial paper, debt due in 270 days or less. SachsenLB obtained 17.3 billion euros in credit on Aug. 17 from German state-owned banks to repay debt from Ormond Quay. All this year, the US and Japan cleverly joined Europe as they all told China there was no earthly reason to increase their FOREX reserves to over a trillion dollars. I mocked this effort. I even suggested Japan put its dollar reserves where its mouth was but of course, Japan simply wanted China to be punished and reduced as a trade rival. China was not fooled by all this. Either they read me or they are smart. I am betting on the 'smart' part. I found them to be very swift learners when things happen fast. The IMF and World Bank joined the propaganda effort to stop China from running the world's biggest FOREX reserves. Then Russia suddenly appeared out of nowhere with the world's #3 FOREX reserves! Even I was taken back by this sudden surge. I did recognize what it meant, though: Europe's battle with Russia was lost. Russia could now control relative values of the euro and the dollar via their FOREX reserves! For the last 10 years, while Japan patiently built up their economic firepower via their FOREX reserves, I have warned the Federal Reserve about this and warned them, the US MUST MATCH JAPAN by buying up yen! In equal amounts! Far from it! We hold about $20 billion in yen in our own reserves which is insanely small. The Japanese holdings of dollars is 45X greater than our reserve holdings of yen! The euro nations have collectively, about $350 billion in reserves which is one third of what China holds. But I have no idea what the REAL reserves are anymore since the US and Europe just wiped out our real reserves with that bank rescue just a few days ago. This rescue operation wasn't because we ran out of money. It was to protect the totally fake interest rates that are not attracting European or American SAVERS. Those forgotten people who are the fundamental basis of all banking systems. Neither the US nor Europe believes in saving money of any sort. The fascination with making money grow 10X faster than when it sits in a boring bank account accumulating interest is a great temptation. But we can see the downside of all this! It can grow 10X faster but it can vanish 1,000X faster! The downside is always swifter than the upside. And in this upside-down world we are in right now, the European desire to cut their FOREX reserves and gold holdings will be granted to them..with a vengence! The US and Europe should have realized as first Japan, then China, then Russia and now India and Brazil, all huge markets, suddenly started a race to see who could accumulate the largest FOREX reserves, the alarm bells in Berlin and Washington, DC should have rung loud! BRIIIING BRIIING WHOOP WHOOP WHOOP! Instead of an alarm, Europe and American popped sleeping pills. When China refused to fall for their stupid story that FOREX reserves are only for protecting a currency, I howled with rage. Dummies! FOREX RESERVES ARE FOR WEAKENING CURRENCIES FOR TRADE PURPOSES! Is Japan trying to make the yen weak or strong? The answer is obvious. Time to review the period when Japan didn't have control of the yen and the US made the yen very strong! Although major events do not always happen in August while everyone is away on vacation, prudent financial managers are well advised to take time off in June or July. Aside from major geopolitical shocks, such as the August 1914 start of World War I and the August 1961 erection of the Berlin Wall, numerous financial shocks have appeared in the middle of August. President Richard Nixon's abandonment of fixed exchange rates and the gold standard shocked the financial world on Sunday, August 15, 1971. On Friday, August 13, 1982, Mexico's finance minister revealed to the U.S. Treasury that Mexico could not service its debts, an event apparently forgotten during the 1993-1994 capital rush back into Mexico. August 1995 witnessed a sea change in global currency markets. The U.S. dollar, which had been chronically weak against most currencies and especially so against the Japanese yen for more than a decade, decisively cut through the key level of 95 yen per dollar--a level considered unbreachable in view of the dollar's decade of chronic weakness. True, breaching the wall of 95 yen per dollar was engineered by the world's major central banks, which purchased more than $3 billion to ensure the dollar's ascent. But the strength of the dollar's upward move against the yen--which can be gauged by a comparison with the widely heralded strength of the U.S. stock market--was not due entirely to central bank intervention. On July 6, just after the Federal Reserve eased monetary conditions by reducing its federal funds rate from 6.0 to 5.75 percent, the Standard & Poor's index stood at 554. Slightly more than two months later, in the middle of September, the index had risen by 5 percent to 582. By comparison, on July 6, only 85 yen could purchase a dollar. By the middle of September, the dollar had strengthened by 22 percent so that 104 yen were needed to buy a dollar. A dollar rise of this magnitude in a market where hundreds of billions of dollars are traded daily requires more than several billion dollars' worth of official intervention to push up the dollar. While it is correct that the dollar's 22 percent uptick against the yen since early July is nearly three times the appreciation of the trade-weighted dollar, the combined efforts of central banks to push the dollar up could not have succeeded so dramatically if they were not pushing the dollar in the direction that fundamentals were indicating. This article is a good review of what happened back then without being too smart about what lessons we should learn from this episode. The AEI is a stupid organization that thinks America is strong and we have the world's best economy. So they thought that we were strong and stronger even as the yen helped our bottom line. Namely, the strong yen meant our trade deficit, for the first time in upteen years, began to fall. It wasn't the yen that was mostly doing this, it was RUSSIA. Russia began to flood the world energy markets with nearly free oil and gas. This golden age meant the price of oil was $10 a barrel and gas was cheaper than a gallon of bottled water and the US went on an energy binge, buying ever-bigger gas guzzlers to my total irritation and horror. For this was very temporary. Meanwhile, while the entire industrial world especially Europe basked in this Russian flood of super-cheap energy, Japan fell into a total depression with the price of property, assets and stocks collapsing with tremendous speed! The important thing for Germans to understand today is, Germany today is where Japan was in 1994 when the yen went for 86 to the dollar. The Bank of Japan, seeing industry die, set out to deliberately kill the yen. It fell like a rock! After it settled into the prefered range of 110-130 yen to the dollar, the Bank of Japan began its new program of buying up dollars to weaken, not support, the yen. I told the Chinese years and years ago, if they want to best the US in trade, to imitate the Japanese. So the Chinese noticed this and as soon as they got 'Most Favored Nation' trade status, they instantly ordered the Bank of China to begin hoarding dollars, too. This strengthened the dollar! And the US markets went nuts! WE ARE SO RICH! EVERYTHING IS CHEAP! The US consumer was god! And to recycle the value of the dollars the Bank of Japan and now, the Bank of China were hoarding, they lent this loot back to us and on top of controlling their currencies by strengthening the dollar, they made money lending us our own trade deficit with both of them! Now, they are doing this to Europe. China raised interest rates for the fourth time since March to cool the world's fastest-growing major economy after inflation surged to a 10-year high. The benchmark one-year lending rate will increase 0.18 percentage point to 7.02 percent tomorrow, the People's Bank of China said on its Web site. The one-year deposit rate will rise 0.27 percentage point to 3.6 percent. China, unlike Japan, has a quite different domestic policy. China wants the Chinese people to live better and better. Japan is deliberately and maliciously crushing the lives of its own lower classes trying to make them as poor as the poorest Chinese laborer. So Japan has zero inflation due to the lower classes losing wages and purchasing power. But in China, they are gaining so China is raising interest rates. At home. But China has been, up until August, still hoarding dollars. I think they have stopped. They won't say. They are quite secretive when they are making changes like this. Europe is foolishly following the US economic model. This is due to pure propaganda. The US looks rich because we were able to spend way, way beyond our means for a long time due to the Bank of China and the Bank of Japan. And indeed, now many big nations who imitate the clever Asian powers. Europe thinks the path to wealth is to have everyone hold euros and sell stuff like mad and give out free loans via the stupid 'carry trade' which is much more akin to the opium trade in the 19th century. U.S. two-year notes rose, pushing the yield below 4 percent, on speculation the Federal Reserve will cut interest rates. The difference in yield between two-and 10- year notes reached the widest since 2005. Traders are betting the central bank will lower its 5.25 percent benchmark rate by its next meeting on Sept. 18 to stem turmoil in the credit markets. Investors sought the relative safety of government debt on concern that the U.S. subprime mortgage crisis will spread to money market funds. Hell, let's just imitate Japan and put it back at 1%! Why bother with pretending we have a real economy at all? There is one difference between Japan's nearly free money which didn't drop to 0% accidentally, it only occured several years after the 'depression' began and Japan's banking system collapsed. Do you save a BANKING system by offering no interest on SAVINGS????? Of course not! That is pure insanity! But someone big was saving...a lot of money! The Bank of Japan was saving...US dollars! Duh! So the regular Japanese were denied interest on their tiny savings. Since then, they have been made out to be chumps but the bigger chump was the US who didn't instantly begin hoarding yen! Instead, we commiserate with Japan over their 'depression' which has been totally fake for the last 7 years as their economy shoots higher and higher and their FOREX reserves had to shoot to the moon to keep up the weak yen. So markets are punishing Countrywide irrationally -- and dozens of other basically sound companies are caught up in the maelstrom. Despite some tut-tutting from inflation hawks, the Fed had no choice but to throw a lifeline to the financial system on Friday, softening the terms on which it stands ready to lend to banks and signaling that it will cut interest rates if need be. At times like these, the Fed's responsibility to stand tough against inflation is trumped by its responsibility to stand tough against financial panic. When nobody is willing to put money in banks and thereby keep them solvent, it is the Fed's duty to serve as the lender of last resort. The latest fairy tale being told by all the yapping mouths in America's economic media is that the recent banking collapse which evidently began in Europe as far as we can tell, was 'panic' and not a collapse of something very important. I wondered at that time why interset rates on overnight intra-bank borrowings suddenly shot up. One of my European readers even sent me a chart which showed the instantaneous spike and he marveled that it was so strong and unexpected. I sat up and whistled. Oh boy, it looks like the FOREX weakness of Europe is showing up now! For unlike the Asian central banks who hold their FOREX funds close to their chests like all good poker players, Europe's are not held by a central bank. That bank has no control over the FOREX accumulations of the various countries that are part of the euro system. Indeed, in order to convince the Asian powers that FOREX reserves were useless appendages and indeed, openly stating just last month in July, to my immense amusement and horror, the central bank for the euro declared FOREX reserves to be totally unnecessary and indeed DANGEROUS. And should be dropped. Amazing, isn't it? And I savaged them for this stupid idea. The stupidest country of all remains the US, it is the core problem here. The US, by cutting interest rates right in the teeth of proof that world banking needs higher rates, has weakened the dollar for the US knows the path to strength is to be super-weak in the interest rate arena. This will kill us in the end since we are not saving, the more we play this game, the more we are in trouble due to going deeper and deeper into debt. To stop this process suddenly would plunge us into a depression but to make it worse by dropping interest rates below the rate of inflation means slitting our wrists and if Europe thinks they can keep the dollar alive while not accumulating huge FOREX reserves, they are nuts! All currency games are played by whatever rules work. Since we enjoy the free money/free loans carry trade offered by the smarter Asian banks, we will continue our industrial and financial decline. Europe is now being forced into the same role. The feather bed of easy money will be set up in Europe and all industry will die there too. And the ancient rule of Asia as the world's top economic power will return with a vengence. Ah, I knew that and simply forgot to mention it! thanks. It is a TOP item and I will mention it later. Japan is using it to protect the YEN, not the rupee. Namely to keep the yen relative to the rupee in a good spot so it stays weak against the euro and the dollar. And perhaps...the rupee itself. Great post Elaine - learning a lot from you. Still, the old $1 to 114 yen is back in business - let the free money flow! As an expat in Germany, it seems to me that a consumer culture doesn't appear to be as popular as in the US and there remains a sense of avoiding living beyond one's means. Also Wal-Mart has pulled out of Germany (or at least my city). Overall though - how can easy credit and cheap Chinese goods be resisted in the long run - they can't, unless there is global recession. Germans and Japanese have less physical space to fill with stuff. In America, we have bigger and bigger houses filled more and more with stuff. I go to homes where you physically cannot walk from room to room without climbing over tons of toys and junk. Children who had small toy boxes in my childhood---I had so few toys, got only 2 per year, that I had no box...my parents were wealthy enough, we had 3 cars, a huge swimming pool and a ranch with horses when I was a girl, but few toys. My mother hated clutter of any sort. But the clutter gene is at work with a vengence in America, children here have rooms filled to the gills with toys which scatter all over the house with a vengence. As well as adult 'toys'. And all sorts of 'decorative' stuff that makes the Victorian desire to fill up all spaces with stuff pale in comparison. The euro can't rise much more vis a vis the dollar and the yen but the Bank of Japan seems bent on doing this and Europe has little in the way of centrally-controlled FOREX reserves to protect themselves from seeing their currency inflated. This is the fatal flaw in the euro and is why it is the dumping ground of all the other competitors for world trade advantages. Hello This is really very interesting Post.... from the pics actual thing is clear to me... It is a TOP item and I will mention it later. Japan is using it to protect the YEN, not the rupee. ha ha ha..... oh that picture is looking awesome. really I enjoyed your blog... It's very interesting.... Thanks very much! Great news topic I feel very bad when I heard this news. How such type of incidents happen in airlines only. Why the have not taken proper measures to stop such nonsense event. A quick question, if you want to participate in your challenges, do we have to use Prima products ... I don't have any yet, and sure would like to play along for a chance to win some...? This is amazing post here..... really that snap is looking so interesting. Thanks for sharing it. I like your blog. Keep posting. I'm looking for some more information form you.